Cerebral autoregulation reflects the ability of the cerebral microvasculature to adapt to systemic blood pressure (BP) changes by modulating the small vessel resistance to maintain relatively stable blood flow. Noninvasive assessment of cerebral vasoregulation is important for medical diagnostics and acute care. Recent studies have demonstrated that beat-to-beat measurements of BP and cerebral blood flow velocities (BFV) measured by transcranial Doppler ultrasound (TCD) during the Valsalva maneuver and head-up tilt can identify impairment of cerebral vasoreactivity in various medical conditions; indicating that a reliable, non-invasive index for dynamic cerebral autoregulation may be extracted from the BP and BFV signals. Conventional approaches model autoregulation with BP as input and blood flow as output (e.g., Windkessel models) and assume that signals are composed of superimposed sinusoidal oscillations of constant amplitude and period over a pre-selected frequency range. A transfer function is typically used to explore the relationship between BP and BFV by calculating gain and phase shift between their spectra. However, BP and BFV signals are often nonstationary, and are modulated by nonlinearly interacting processes at multiple time-scales corresponding to the beat-to-beat systolic pressure, respiration, spontaneous BP fluctuations, and those induced by interventions such as the Valsalva maneuver and postural changes. To overcome problems related to nonstationarity and nonlinearity, Novak et al. recently developed a novel computational method, the Multimodal Pressure-Flow (MMPF) technique to analyze the BP-BFV relationships during the Valsalva maneuver. Unlike conventional approaches that are based on the Fourier transform and thus require linearity and stationarity of the signals, the MMPF analysis does not rely on these assumptions. 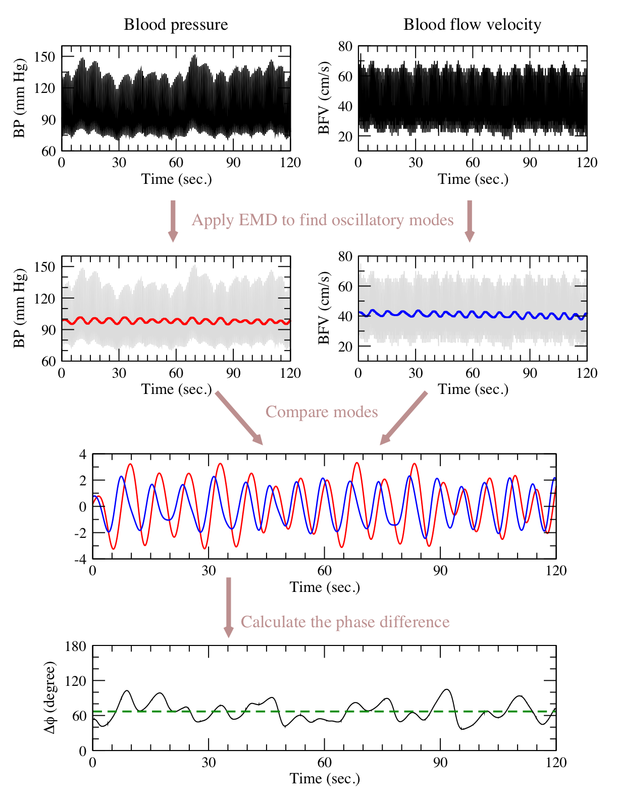 Instead, the MMPF technique evaluates autoregulatory dynamics based on instantaneous phase analysis of BP and BFV oscillations. The MMPF analysis applies the Empirical Mode Decomposition (EMD) algorithm proposed by Huang et al. to decompose complex BP and BFV signals into multiple empirical modes. Each mode represents a frequency-amplitude modulation in a narrow frequency band that can be related to a specific physiologic process. As a result, MMPF analysis not only can be applied to protocols such as the Valsalva maneuver and sit-to-stand conditions, where large BP and BFV oscillations were induced by the interventions, but can also be used to study spontaneous oscillations of BP and BFV under resting (baseline) conditions . How does the MMPF Algorithm Work? The above figure is an illustration of the MMPF procedure. Continuous BP and BFV signals (panels in the 1st row) of a healthy subject collected under baseline supine conditions are used for this example. The dominant oscillations of BP and BPV, due to physiologic breathing can be extracted by the EMD algorithm (panels in the 2nd row). These two oscillatory modes can then be compared with each other as shown in the 3rd row panel. Note that the oscillatory component of the BFV (blue curve) consistently leads that of the BP (red curve). This phase relationship is an important marker of healthy autoregulation. The instantaneous phases of these two oscillations can be calculated by the Hilbert transform, and their difference is shown in the bottom panel. As apparent in this 2-minutes period, the phase shift between these two oscillations varies around an average value of 67 degrees (indicated by a dark green dashed line). Note that the example shown here reveals a relatively slow respiratory period (cycle length ~ 7 sec.). Typical subjects have a faster breathing rate; however, similar BFV/BP phase shift behavior is observed. In contrast, pathologic impairments of dynamic cerebral autoregulation can significantly reduce this phase shift. Therefore, the phase shift index may serve as a sensitive biomarker of autoregulation. Obtaining a reliable index of dynamic cerebral autoregulation is useful under many clinical conditions. Impairment of vascular reactivity to regulate cerebral perfusion has been found in many syndromes associated with aging, hypertension, stroke, diabetes, dementia and traumatic brain injury (TBI). For example, autoregulation estimates based on BFV and direct measurements of cerebral perfusion pressure (CPP) have shown predictive value for determining outcomes in TBI patients. Therefore, the MMPF analysis may play an important role to assess and monitor dynamic cerebral autoregulation in a wide range of clinical settings [1,3,4]. DynaDx provides an online demonstration of the MMPF data analysis. Please try it out. If you have any questions or would like to have batch data processing service, please contact info@dynadx.com. There are many research papers on dynamic cerebral autoregulation. Here we provide links to some key articles related to the MMPF technique. 1. Novak V, Yang ACC, Lepicovsky L, Goldberger AL, Lipsitz LA, Peng C-K. Multimodal pressure-flow method to assess dynamics of cerebral autoregulation in stroke and hypertension. Biomed. Eng. Online 2004;3:39. 2. Huang NE, Shen Z, Long SR, et al. The empirical mode decomposition method and the Hilbert spectrum for non-stationary time series analysis. Proc. Roy. Soc. London 1998;A454:903-995. 3. Hu K, Peng C-K, Huang NE, Wu Z, Lipsitz LA, Cavallerano J, Novak V. Altered phase interactions between spontaneous blood pressure and flow fluctuations in type 2 diabetes mellitus: Nonlinear assessment of cerebral autoregulation. Physica A 2008;387:2279-2292. 4. Hu K, Peng C-K, Czosnyka M, Zhao P, Novak V. Nonlinear assessment of cerebral autoregulation from spontaneous blood pressure and cerebral perfusion pressure fluctuations. Cardiovasc. Eng. 2008;8:60-71. 5. Peng C-K, Lo M-T, Hu K, Liu YH, Novak V. Multimodal Pressure Flow Analysis Enables Assessment of Cerebral Autoregulation Dynamics During Baseline Resting Conditions. EURASIP Journal on Advances in Signal Processing. 2008 (in press).